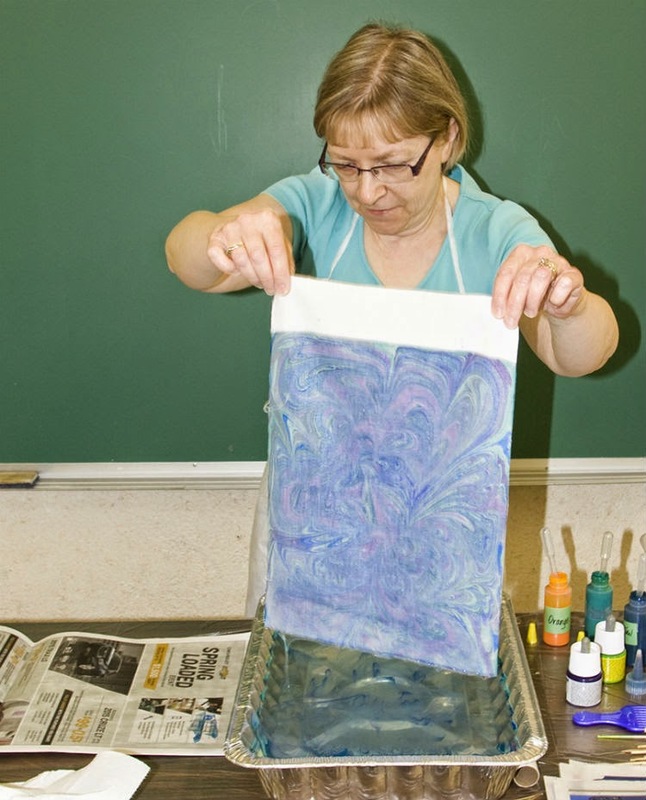 Karen Rowan and Marilyn Bird organized a fun and play type workshop for us recently on marbling fabric and paper. 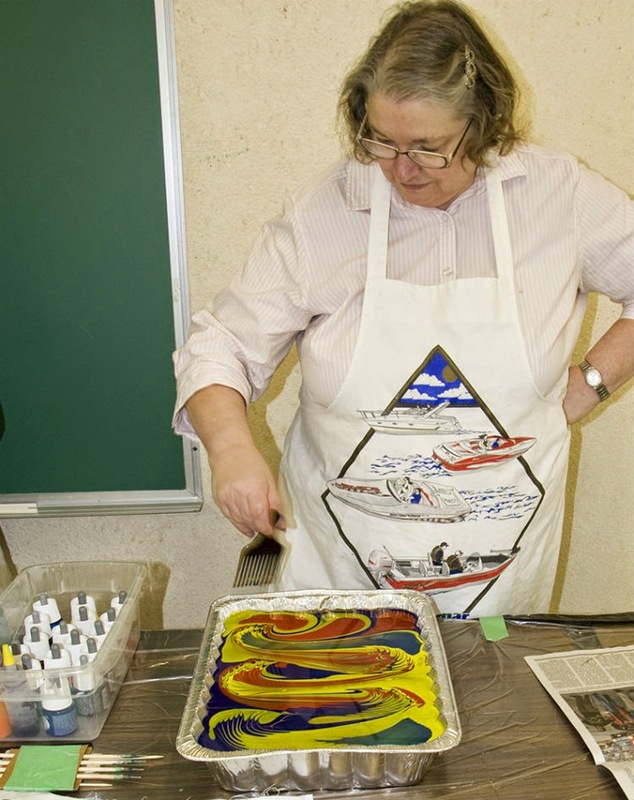 Using Pebeo marbling paint, Karen is demonstrating how to drop/float the paint on the surface of the sodium alginate base. The cotton material we used had been soaked previously in soda ash to act as a mordant so the paint would adhere to the fabric. 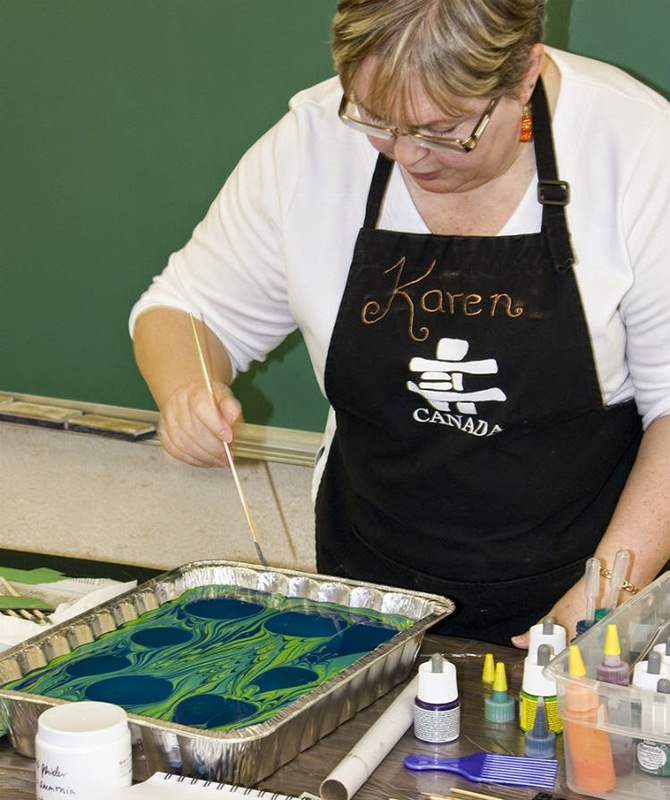 Karen's beautiful marbled design has adhered to the fabric. The colours are exceptionally vibrant and do not wash off after rinsing. 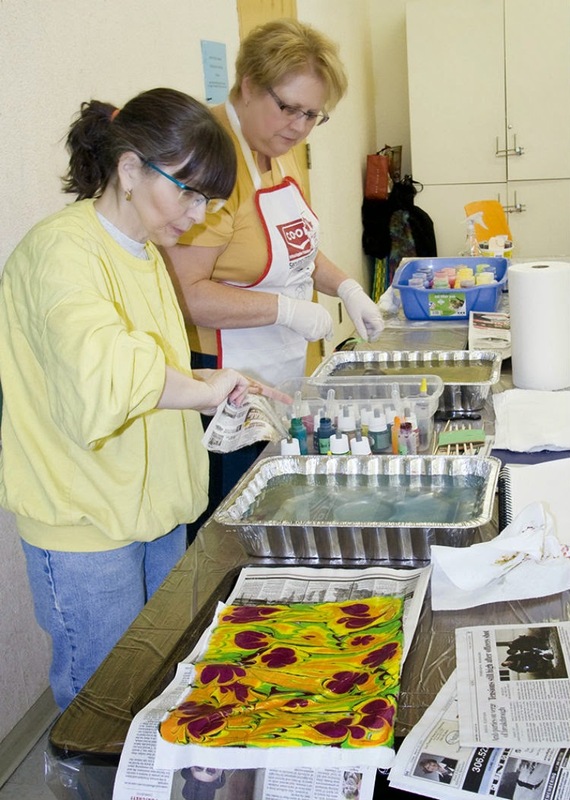 Carol Storie and Ellen Basler floating their paints. 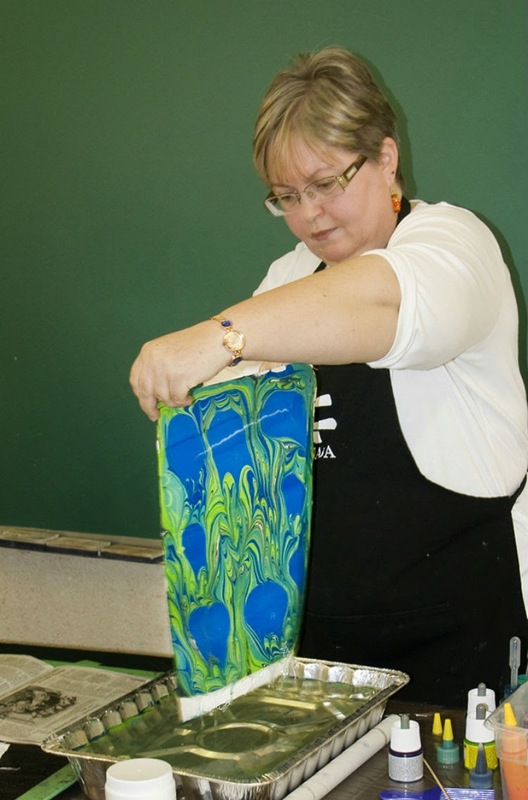 After swirling and creating a design, Carol is adding a few more drops. 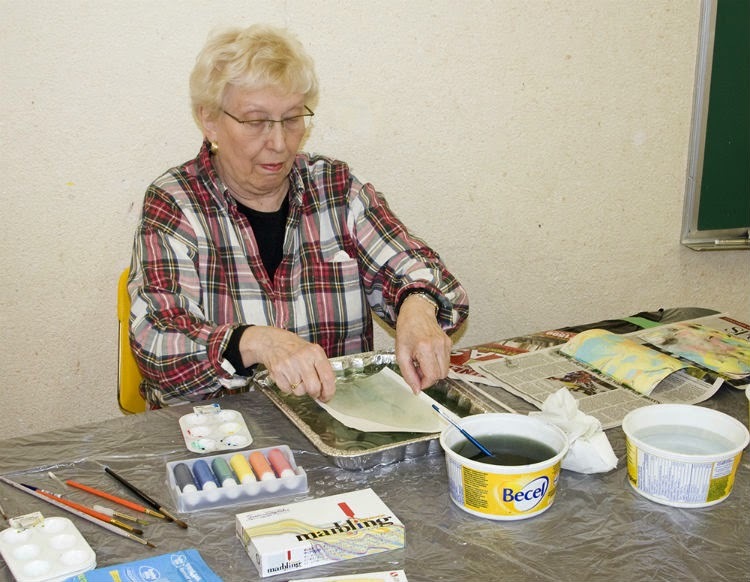 Ellen is swirling her paints using a hair pick. We also used skewers and combs. Carol lifting off her fabric and the finished design. The fabric was then rinsed and will be heat set. 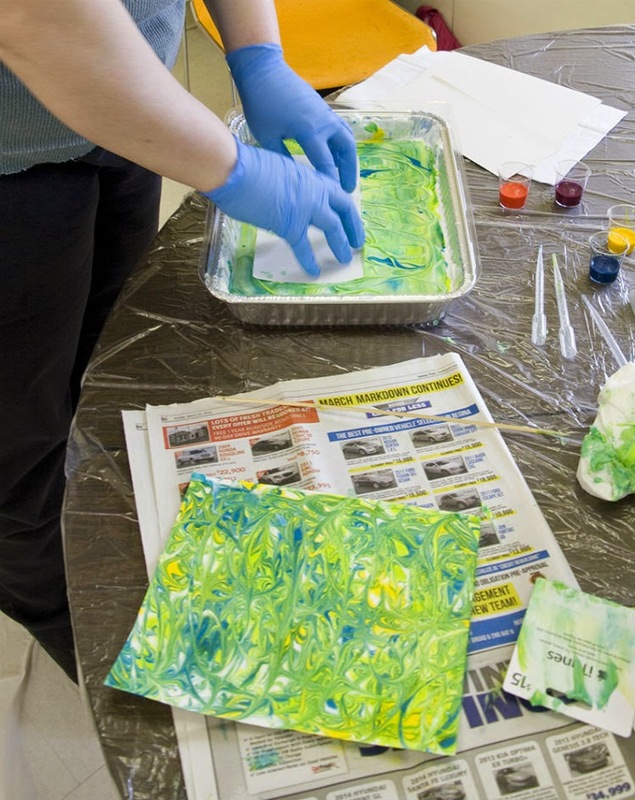 We also played with marbling on shaving cream. This is Wanda Paul's tray and one finished piece. 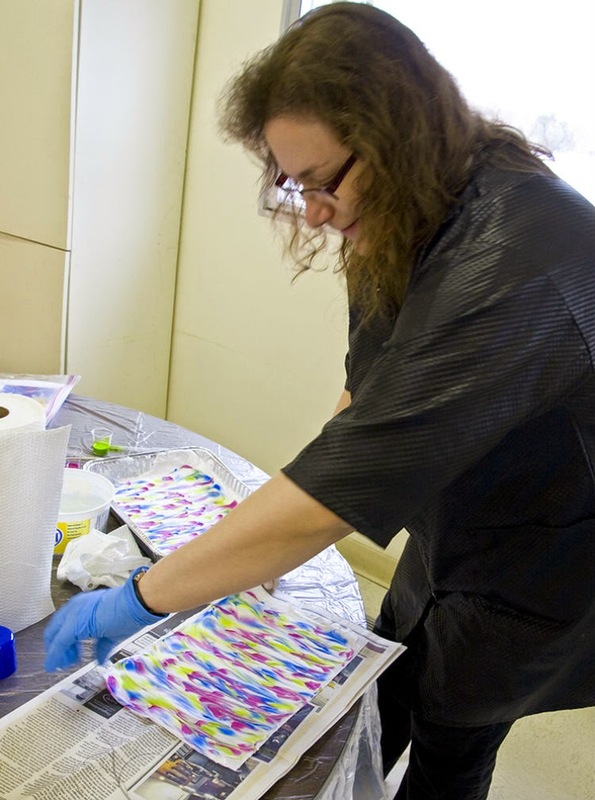 Andrea Laturnas is laying out one of her shaving cream marbled pieces. 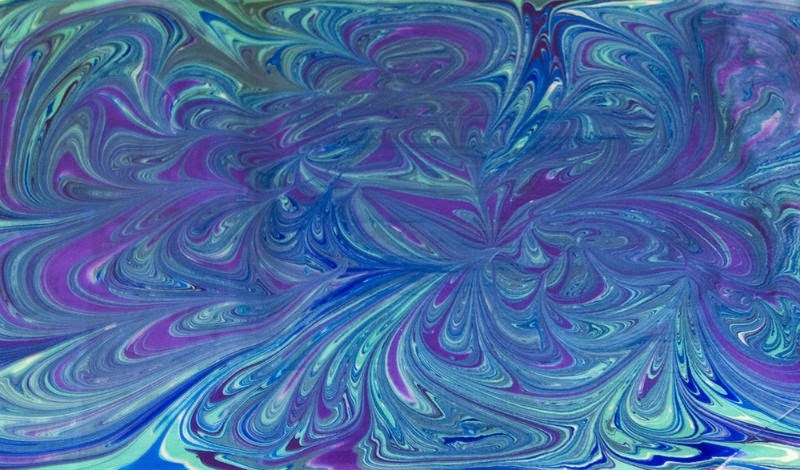 Drop's of Dye-na-flow paint on shaving cream. 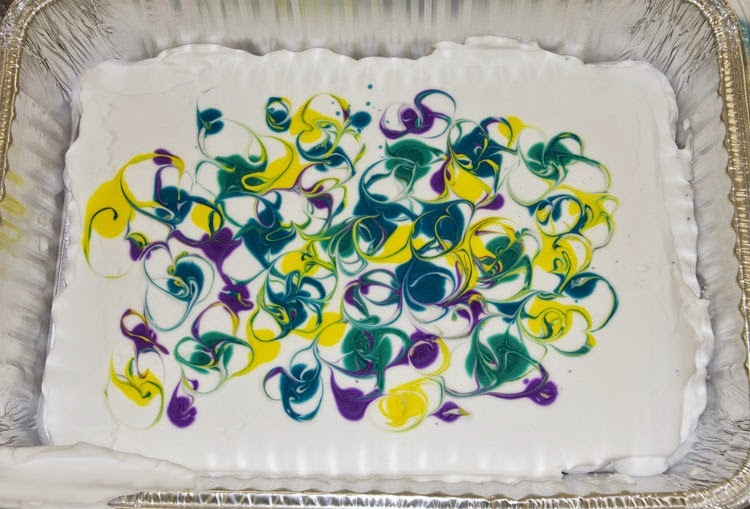 One other type of marbling we tried was with the shuminagashi marbling inks. 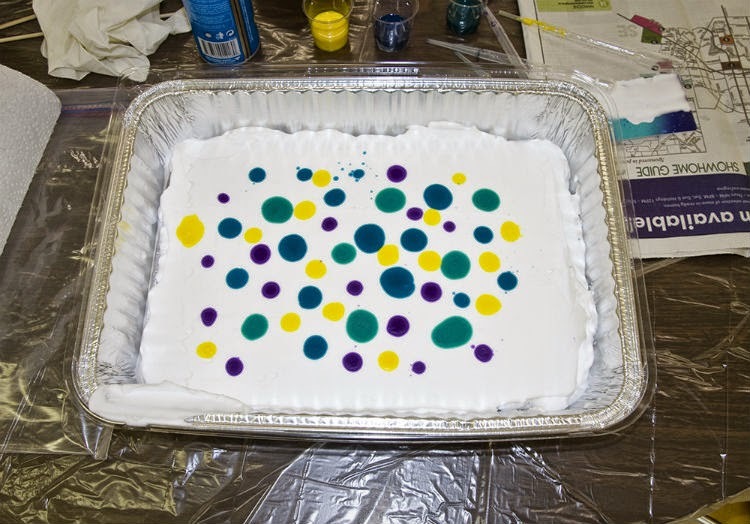 The base is water and the tip of the paint brush with ink on it is lightly touched to the water to float on the surface. 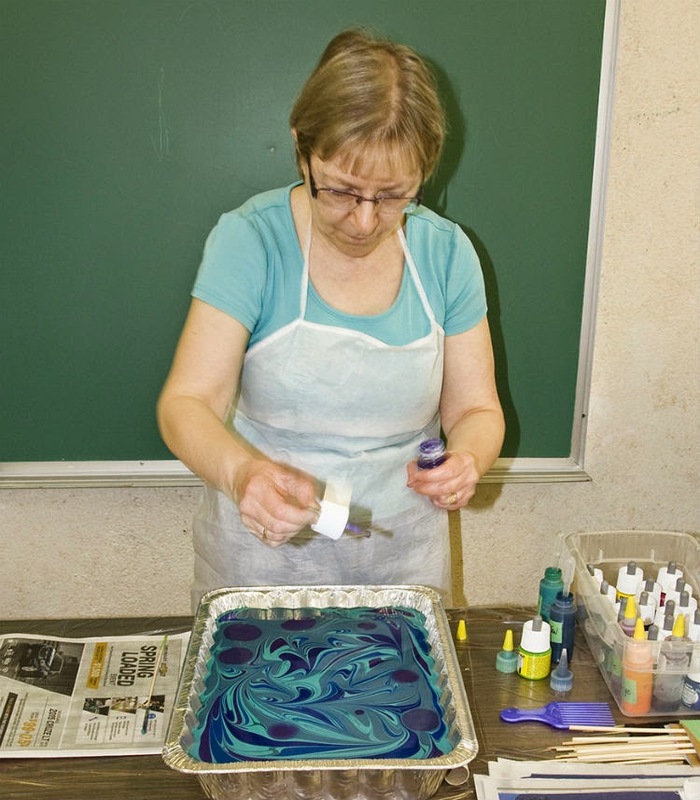 To swirl the inks we used straws to gently blow across the water. 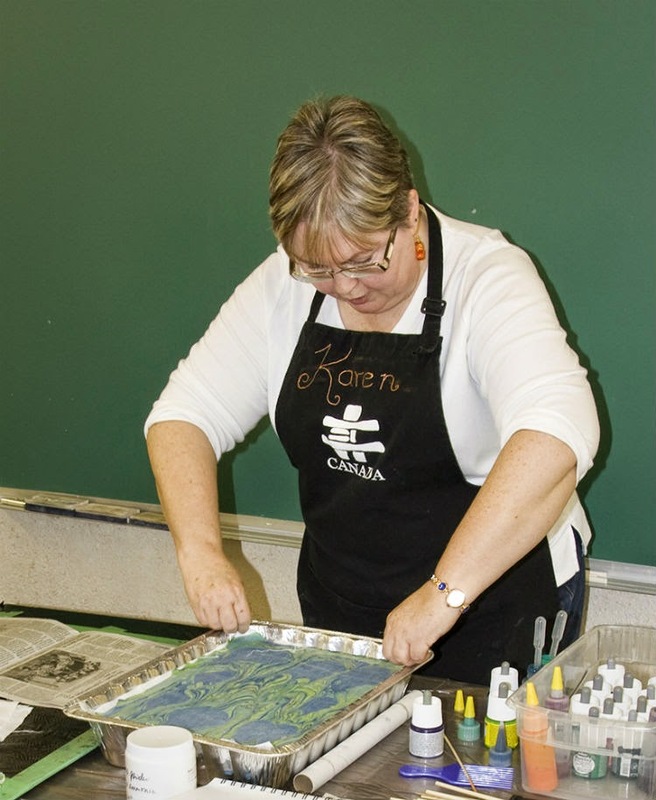 Here Corrie Beyer Koopman is marbling rice paper. 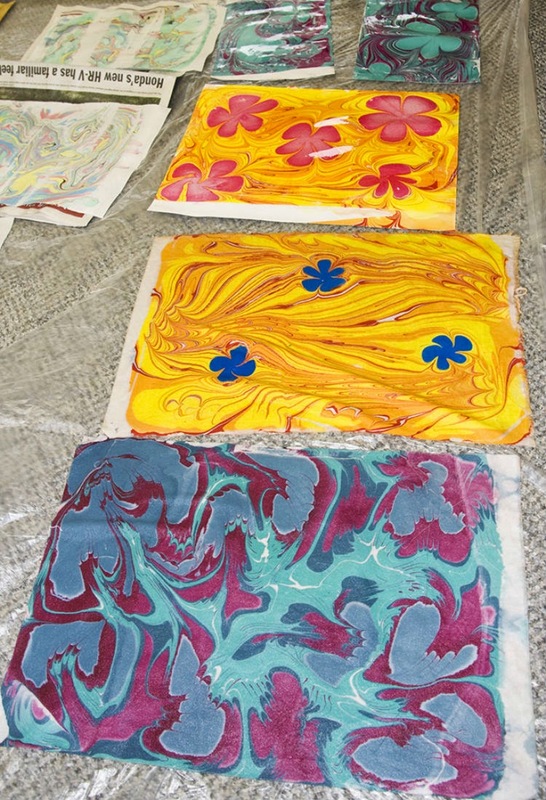 We also marbled various weights of water colour paper. 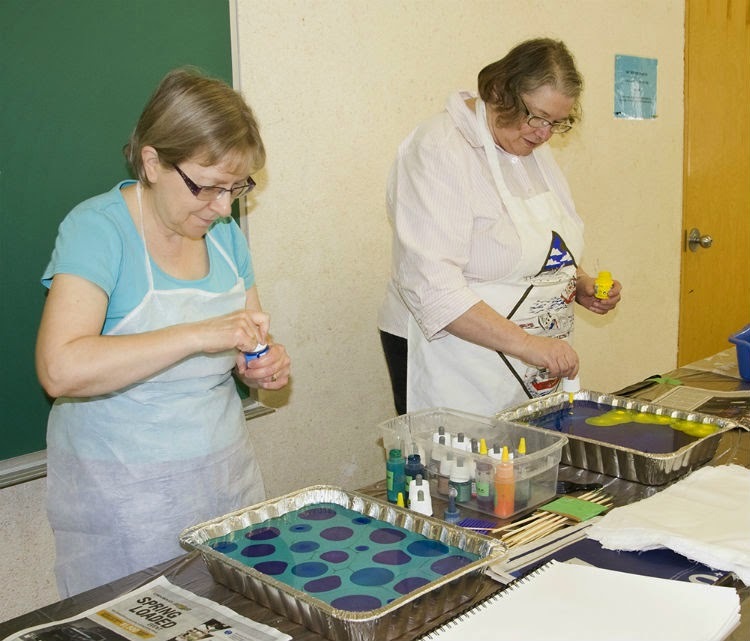 We took turns at the various types of marbling that was set up for us and here Sandra Preikschat and Sheree Sentes are marbling away. A small sampling of our fabric and papers on the floor. It was such a fun afternoon and we all left with some beautifully marbled fabrics and papers. Karen and Marilyn challenged us to make something with our pieces to bring to our next guild meeting. Thank you Karen and Marilyn for a wonderful workshop! This looks wonderful! I wish I had a chance to play along at this workshop! I too wish I lived somewhere to participate with this. Wow, great stuff ladies.